Did you know Welding Twitter was a thing? Apparently, it is! The welders’ much-deserved moment in the sun came last Friday. 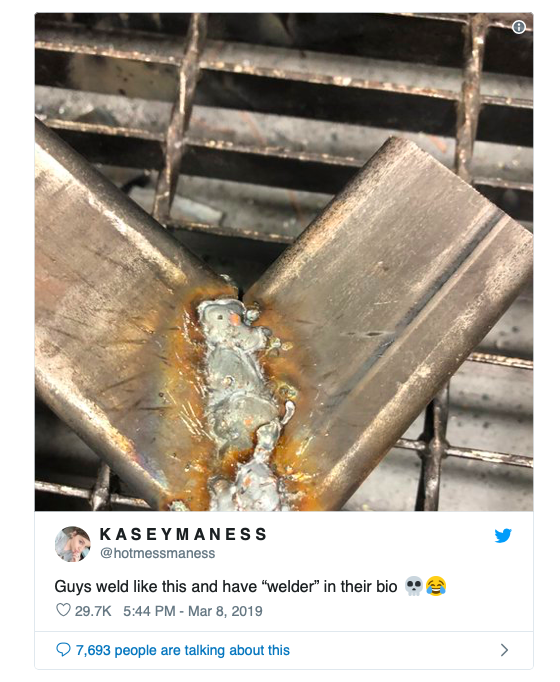 Twitter user @hotmessmaness (real name Kasey), tweeted about the bad (male) welders she sees online. “Guys weld like this and have ‘welder’ in their bio,” she wrote. Fortunately, it was the good welders, not the bad welders, who noticed Kasey’s complaint. The replies to her tweet are now full of clean and smooth welds, as well as people complimenting each other on their welding skills. Click here for Kasey’s original post.